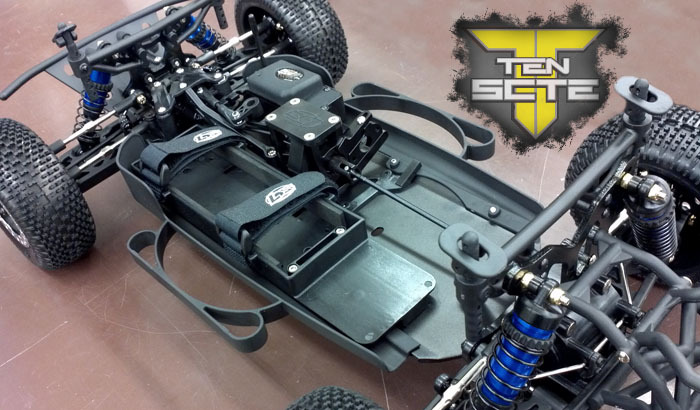 Losi TEN-SCTe is in Stock! It's finally here! The new Losi TEN-SCTe Race Roller arrived in stock yesterday. I managed to snap the above picture before it went out the door a few minutes later. But we got another one in today! So we have one in stock at the moment, and they are going to be hard to get for a while, according to Horizon. So come get it soon, or you might be out of luck for a while. This bad boy is based on the TEN-T chassis, and as such, shares many of the parts in common. So there should not be a problem with availability for parts in the near future. It's four-wheel drive, which makes it an immediate competitor to the currently meager class of 4x4 short-course trucks out there. Because it's a "race roller", it needs a motor/esc, radio, steering servo, polycarb paint (for the clear body), and a pinion gear. Since I have already run into this issue, I'll pass it along. The only pinion gears that Losi makes for this truck require a 5mm motor shaft. And since it's a Mod 1.0 gear, it's hard to find one for the more standard 1/8" shaft (for 540 or 550 can motors). However, it was brought to my attention earlier today that Ofna does, in fact, make Mod 1.0 pinions for a 3mm shaft (1/8" is roughly equivalent to 3.2mm), and those should fit with no problem. I'm excited to see how well these guys move (and drive)! If you have one, or want on, let us know on our Facebook page!